I confess I love creative writing books, and I buy them with all the zeal of the recently converted Amazon Prime subscriber. I continue to buy them even though a good deal of them are repetitive and dull, and inspire me no more than staring into the depths of my laundry basket. Personally I’ve never got beyond about week 6 (which may be why I still feel blocked) but I’ve carried the tool of morning pages with me through every fallow period (and I know many writers rely on them). The idea is to write three pages a day, preferably in the morning, of whatever you like. No editor, no critic, no stopping. It works. Whatever rubbish I write I feel better for at least having done them. Fearless Creating by Eric Maisel. A confession: this is a new purchase for me, and I was attracted by the idea of tackling the anxiety I feel about writing (I took a long break, I had a baby and now am brain dead, I have no ideas left – that sort of thing). Maisel is a psychotherapist who works with creative people from all disciplines, and this book is unlike the others that encourage you to sit down and pick up a pen, or go for walks in the woods. One of the very first exercises involves a potato. It may not be the book for you, but I laughed so much while trying to hold my potato that I have to include it. The 3a.m. Epiphany by Brian Kitely. If you’re after writing exercises that push you a little further than ‘be inspired by this image of a camel’ or whatever, then this is the book for you. Kitely teaches Creative Writing at the University of Denver, and takes the approach that we can learn about writing by actually doing writing. The exercises can feel narrow in their scope, but this just encourages creativity, rather than stifling it. It’s Oulipo-like in the approach to using boundaries to encourage free wordplay – just like children, writers play with more freedom if they have a wall to bash against. Highly recommended, as is the sequel The 4a.m. Breakthrough. The Creative Habit by Twyla Tharp. Tharp isn’t a writer, she’s a dancer, but I thoroughly enjoyed reading this book about her creative process, and the tools she’s used in her career as a choreographer. There are practical exercises throughout the book, which focus on developing working habits and encouraging the creative mind to be awake and present, as well as tackling frailities. It ends with a lovely chapter on the necessity of failure, and her admission that she was 58 before she felt like a master of her craft. Very inspiring book. 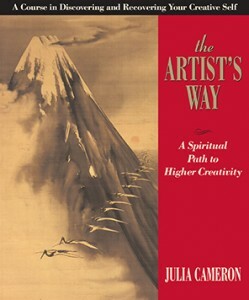 Most of these books can be used by anyone who wants to live creatively, whether that means making a living out of it, or just following your passions for making art of one kind or another, regardless of monetary reward. I hope you too find some inspiration for your Autumn renewal. ‹ PreviousSeptember comes and brings the promise of a new pencil case. Next ›On Art and Money: does anyone have a spare million pounds? I love the artist’s way, doing that program has literally changed my life (yes I did finish, no, I never made the collage thingy). I have decided that I need to do the follow-up program “Walking in this World” right now. Started last weekend, and then didn’t get around to it anymore so far. Well, there is another weekend ahead. Thanks for the other recommendations. The creative habit book is already on my wishlist, and I will check out the others as well. Interesting – maybe I should check out the follow up, though obviously I worry about the idea of fitting in a weekly walk (which I assume is part of the program, although lord knows I could do with it). Let me know if you get back to it this weekend! I’m still struggling to start the whole thing because it’s the beginning of the school year, and we have an insanely lot of new students. Which is a blessing because it means we won’t be broke anymore but is a bit much right now. I did manage to read most of the first chapter so far, but haven’t done any of the exercises yet. they always seem a bit pointless to me, until I do them that is. As for fitting in the weekly walk, when my son was still a baby and toddler I usually took him along in the stroller. I did my exercise the same way, child in stroller, outside, and then walk for half an hour or so. He wasn’t allowed to get out or walk when it was exercise time, despite his protests. All new to me – thank you! The ones I use over and over again are On Writing by Stephen King (LOVE this one) and The Creative Writing Coursebook by Julia Bell & Paul Magrs from the UEA course. Ooh I have both of those. Love the Stephen King one (was a huge fan of his in my younger days) but confess to not having used the other one much, though I was perusing a couple of Magrs novels the other day in a bookshop and realised I’d read one – funny, odd, almost sci-fi/fantasy, but very British from what I remember. May well dig out the Coursebook again, thanks.